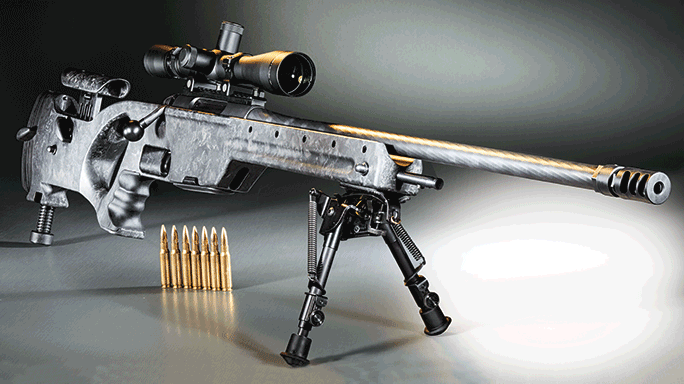 Steyr’s unstoppable AUG A3 M1 is only 28.15 inches long but offers a full 16-inch barrel for improved 5.56mm terminal ballistics. 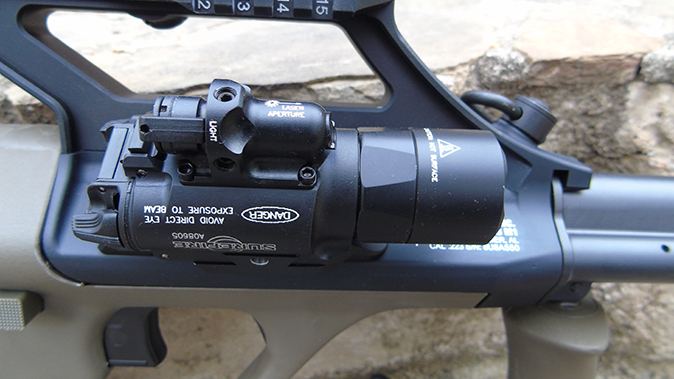 The 1.5X and 3X optics available for the AUG A3 M1 feature rudimentary backup sights on top for close-range shots. 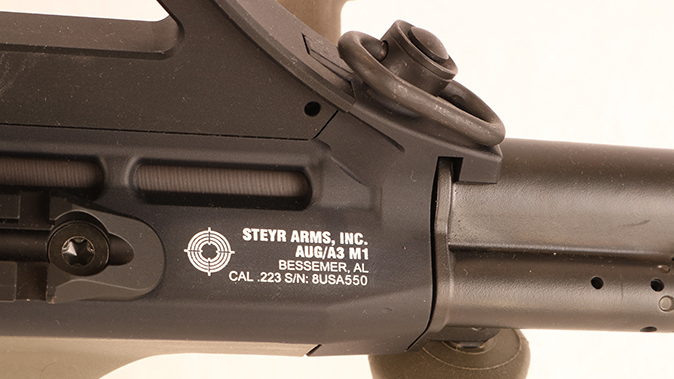 The AUG A3 M1 is made in Steyr’s Bessemer, Alabama, plant. Also note the new sling swivel. 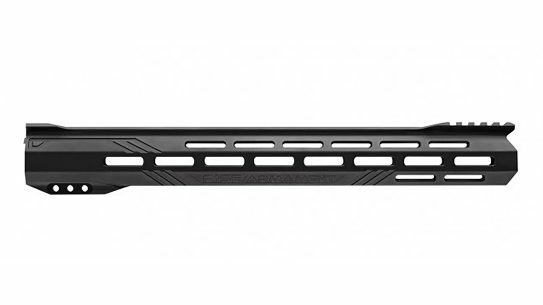 Steyr offers the AUG A3 M1 with a short 11-slot rail, a high 16-slot rail, a 1.5X optic (shown) or a 3X optic. Both optics are decked in extra rails. The AUG is a great choice for a bug-out rifle because of its compact size and proven reliability. Sometimes the most revolutionary ideas reside in the small familiar things. Looking at common things in uncommon ways has produced some of mankind’s most earth-shakingbreakthroughs. Bicycle components became the world’s first airplane, a military radar set birthed the microwave oven, and the handheld transistor radio went on to become the cell phone. 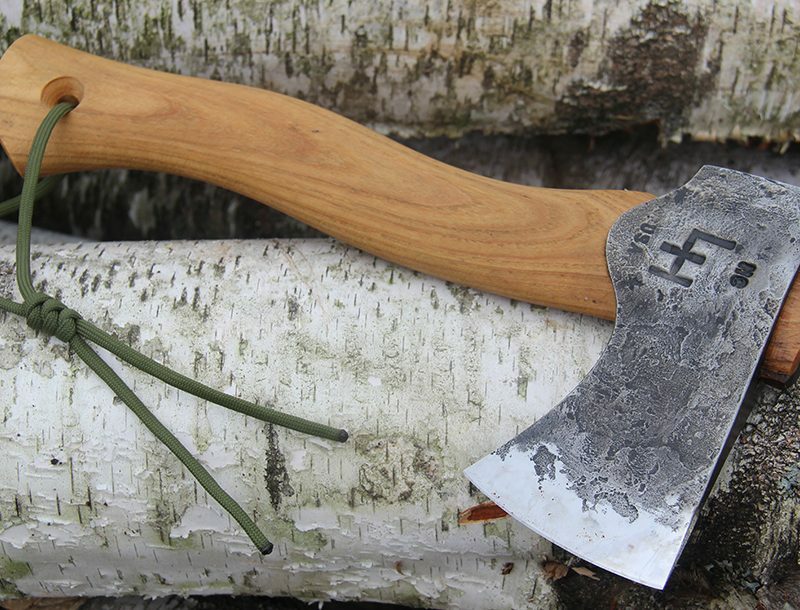 A comparable epiphany helped small arms design evolve. The Thorneycroft bolt-action rifle was patented in 1901. 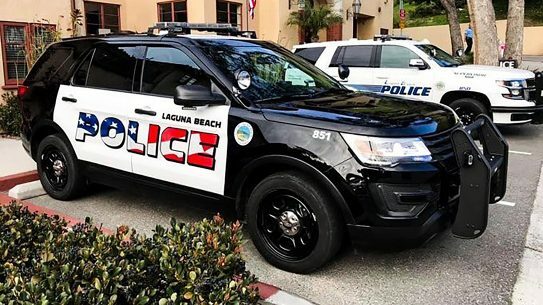 In this groundbreaking design, the action of the weapon was moved back into the buttstock to minimize the weapon’s geometric footprint. Developed by an English gunsmith who produced a bolt-action rifle that was 7 inches shorter and 10-percent lighter than the Lee-Enfield service rifle of the day, the Thorneycroft carbine remained nonetheless ungainly and exhibited fairly brutal recoil. If viewed from the top, the stock of the original Thorneycroft actually angled to the right about 10 degrees to accommodate the unnatural geometry of the gun. 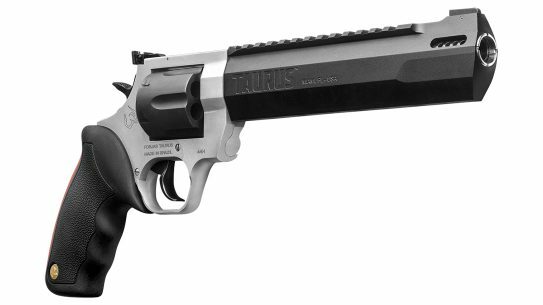 In 1957, the term “bullpup” was used to describe a target pistol with a custom stock. Despite what feels like a lifetime of searching, I cannot find a reliable story as to the true origins of the term. 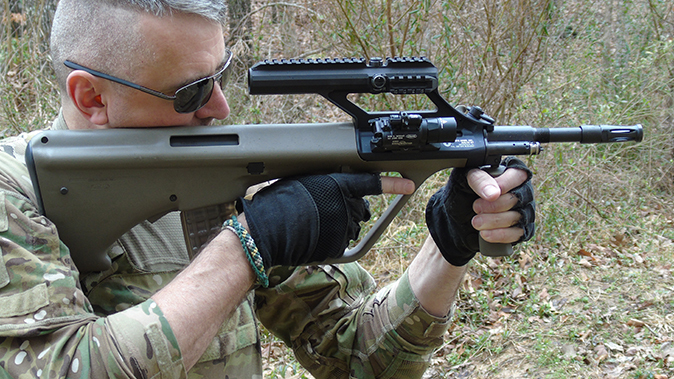 Nowadays, the bullpup moniker describes any weapon wherein the action is located behind the trigger group. 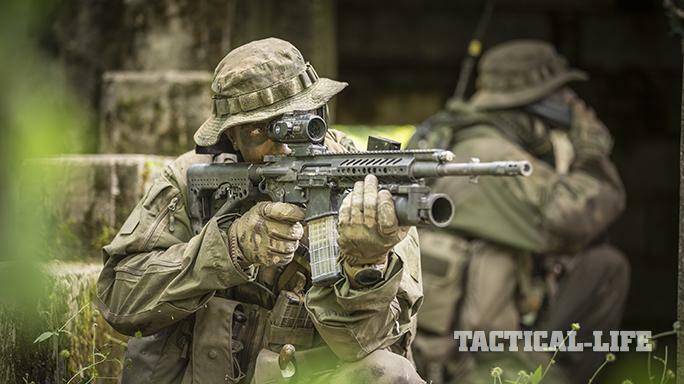 The first successful practical application of the concept came in a truly revolutionary combat rifle born in 1977. The 1970s were a legitimately revolutionary age. While 1969 saw the first man walking on the moon, such stuff seemed almost mundane by the mid-1970s. Spinoff technologies went on to give us things like personal computers, polyester, Kevlar and Velcro. 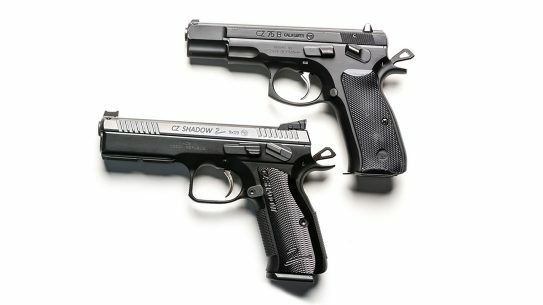 At the same time, engineers at Steyr in Austria began applying cutting-edge polymer science to the art of gun building. When combined with a novel bullpup layout and the newest 5.56mm NATO cartridge, the resulting StG 77, or AUG, turned the gun world on its ear. AUG stands for “Armee-Universal-Gewehr” or, literally translated, “Army Universal Gun,” and the weapon is used operationally by at least 12 countries. The AUG melded state-of-the-art polymer science with superb ergonomics into a platform that also included such revolutionary features as a fire selector built into the trigger and an integral optic. 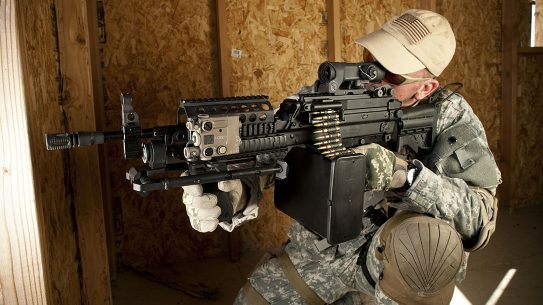 The resulting rifle, while incrementally heavier than the U.S. M4, has its weight more centrally located above the firing grip, which makes for a remarkably agile close-combat tool. When I worked alongside the Australian Army back in the 1990s, they referred to the AUG as the “Austeyr” and built the rifle under license from Steyr locally in Australia as the F88. Aussie diggers bragged about the weapon for its compact footprint, innate controllability, soldier-driven ergonomics and integral optic. 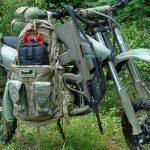 While our American field gear and incidentals eclipsed that of our Australian counterparts, the Aussies rightfully felt that they packed the most effective assault rifle on the planet. Now well into the 21st century, the Steyr AUG is an established design that has proven itself in the ongoing Global War on Terror. 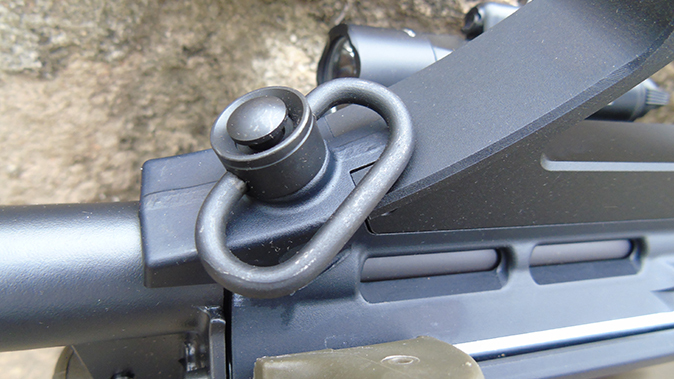 The forward sling swivel is mounted along the centerline, and the rear swivel is reversible. 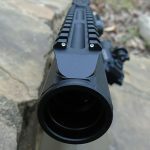 The standard gun ejects out the right side, but swapping to left-handed ejection requires nothing more than exchanging bolts and moving the plastic ejection port cover from one side to the other. 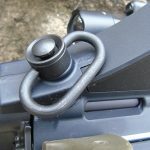 The charging handle is mounted on the left side and is best actuated with the left hand from the bottom to avoid rapping your knuckles on the optics. 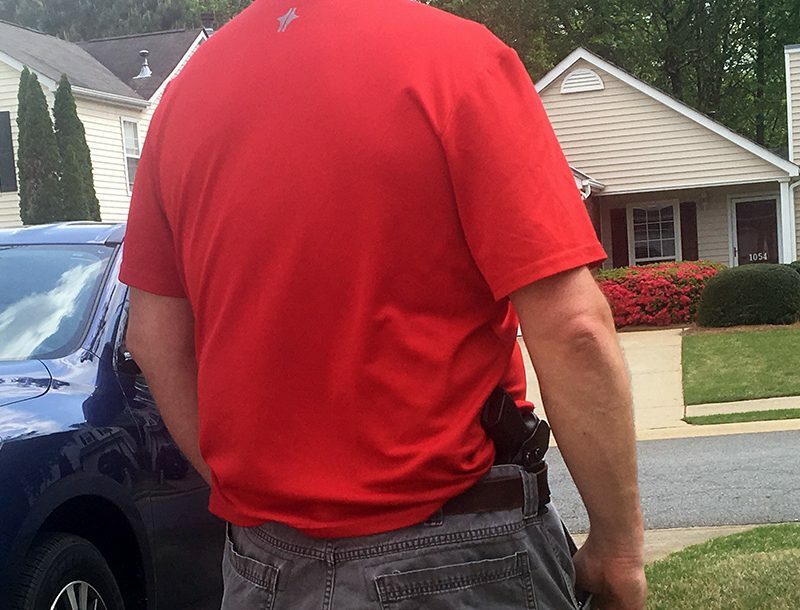 This appendage locks to the rear should the guts of the rifle require inspection. 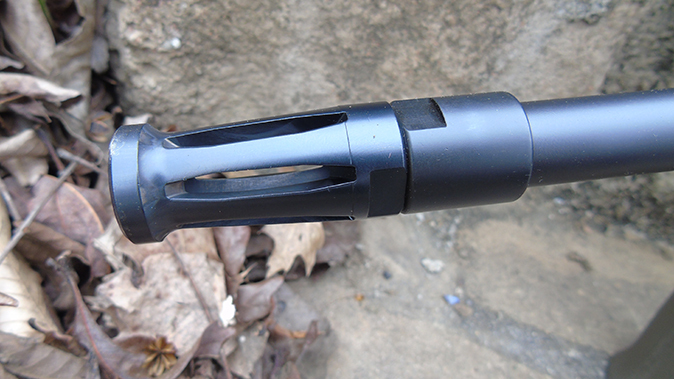 A short Picatinny rail is mounted on the right side, in an offset position, for lights or lasers. 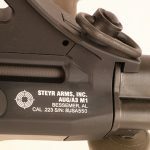 Modern Steyr AUG rifles come with a 16-inch, chrome-lined, cold-hammer-forged barrels, though 13.8-, 20- and 24-inch versions are in service as well. 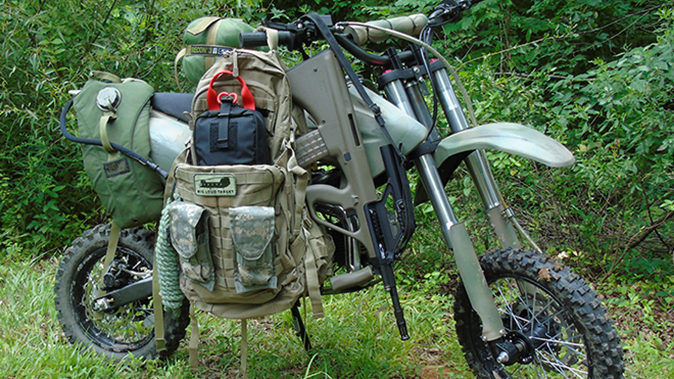 The rotating bolt sports seven locking lugs, and the bolt carrier group rides on a pair of sturdy guide rods. 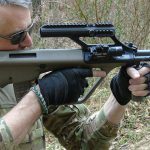 The Achilles’ heel of most bullpup designs is the trigger, as this component has to transmit the movement of the operator’s finger a fairly long distance to trip the hammer. 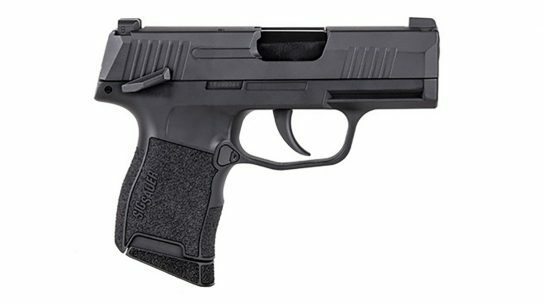 In the case of the AUG, the well-designed 9-pound trigger is remarkably smooth and utterly effective for combat use. The fire control system is entirely polymer, save the springs and pins, yet those I have studied showed no appreciable wear after years of hard use. 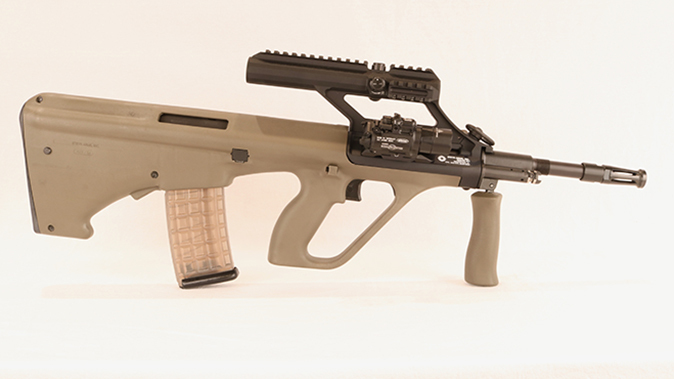 The piston-driven action of the Steyr AUG employs the most modern materials and design features available to produce a rifle that sets a world standard for reliability under harsh use. 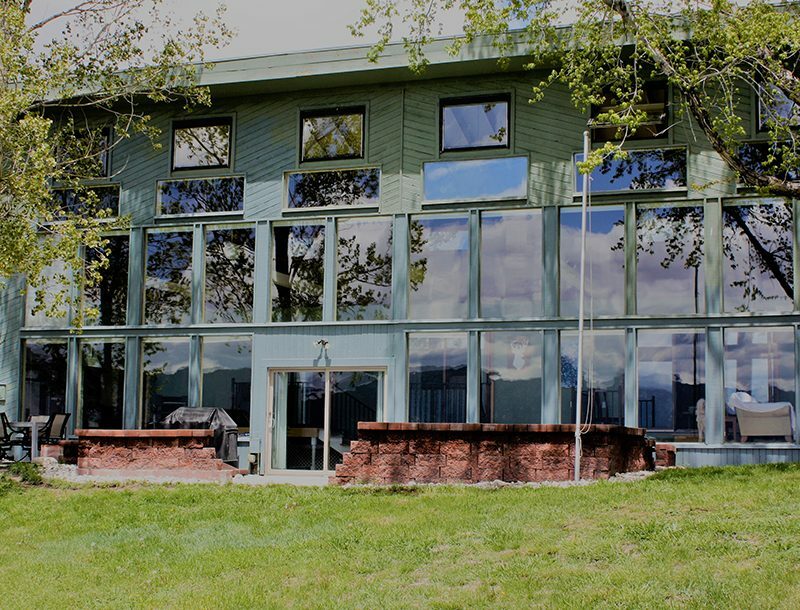 The gas system is readily adjustable without tools and easily disassembles for cleaning. The piston-driven design keeps the majority of the carbon fouling out of the action. The AUG’s magazines are polymer, translucent and all but indestructible. They are available in 10-, 30- and 42-round capacities, and the 30-rounders fit just fine in unmodified M4 magazine pouches. 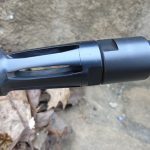 AUG mags disassemble with a bullet tip for cleaning and maintenance, and are every bit the equal to their M4 counterparts in both reliability and ruggedness. 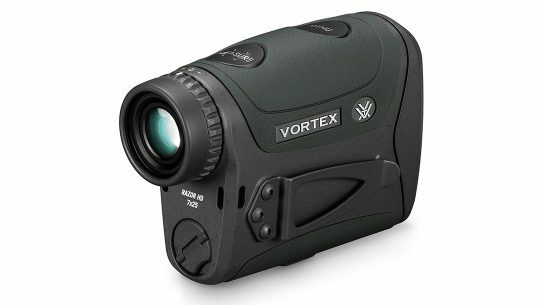 Additionally, their translucent nature allows the operator to see any remaining rounds at a glance. 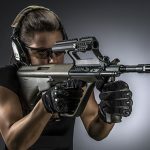 The newest version of the Steyr AUG, the A3 M1, is built in Steyr’s new manufacturing facility in Bessemer, Alabama, and it primarily departs from earlier AUGs by offering a number of optics options. 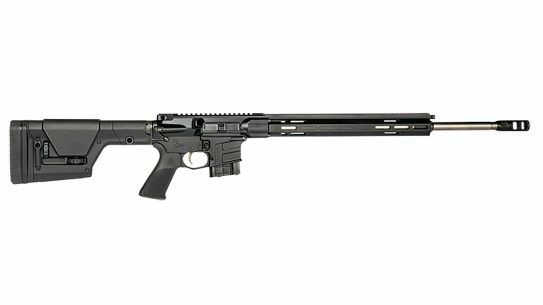 The AUG A3 M1 rifle is available with a short 11-slot Picatinny rail on top, a high 16-slot rail or a 1.5X or 3X optic built into the carry handle. 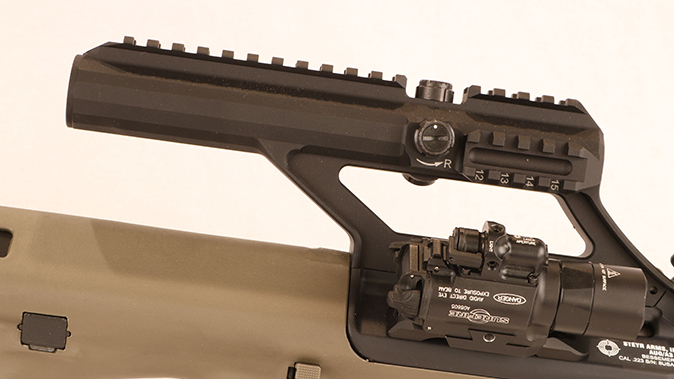 The 1.5X and 3X optics also feature rails on the top and sides for mounting additional accessories. 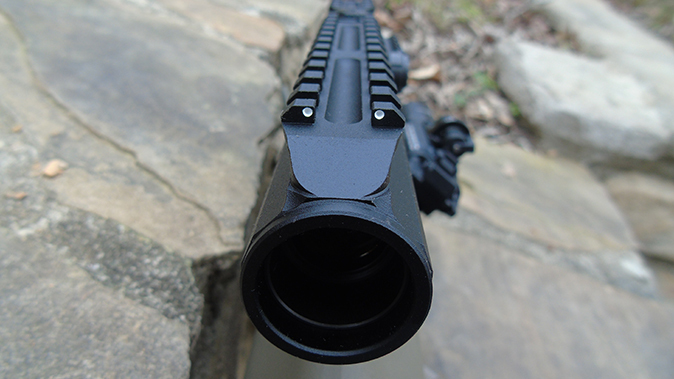 The rail on top of the optic incorporates a rudimentary set of backup iron sights. 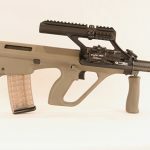 By combining different barrels with different optics, the basic AUG chassis can serve as a close-range entry gun, a mid-range general-purpose combat weapon or a long-range designated marksman’s rifle that is effective out to the limits of the cartridge. 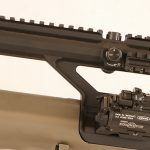 Swapping barrels is easier to do than describe, and exchanging optics rails requires nothing more than an Allen wrench. The new AUG A3 M1 retains all of the revolutionary materials and ergonomic designing that made the AUG such a game-changer in the first place and infuses it with enough accessory real estate to accommodate the pickiest operator. 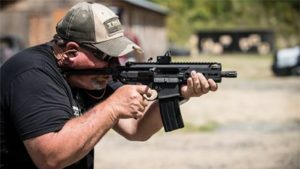 Weighing 7.7 pounds without optics or ammo, the short-railed AUG is indeed about a pound heavier than a comparable stripped M4. 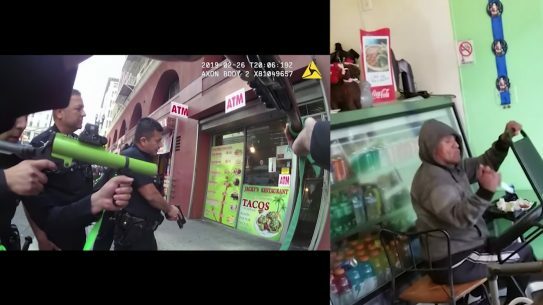 However, the bullpup design makes the gun fully 1.5 inches shorter than a mil-spec M4 with a 14.5-inch barrel, even with the stock collapsed. 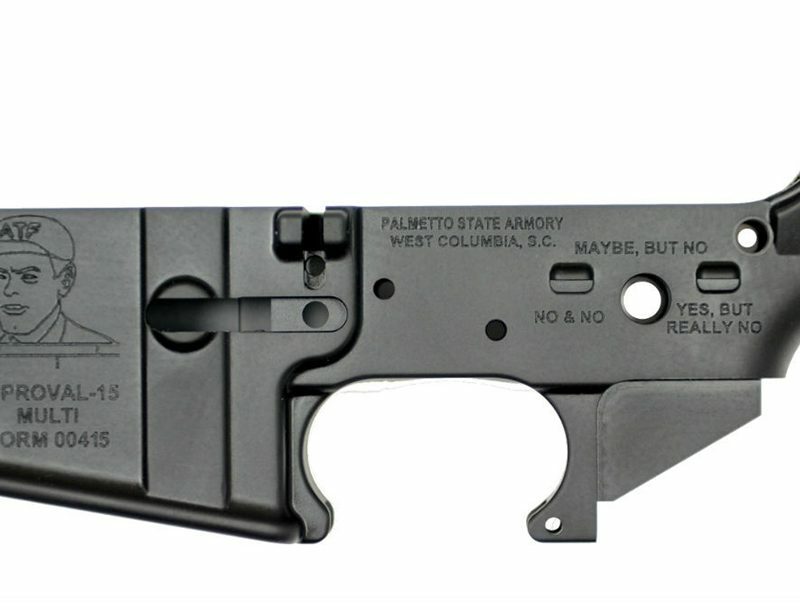 What this means practically is that the AUG offers extra barrel length with the commensurate improvement in velocity and terminal effectiveness in a markedly shorter platform. 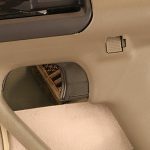 When maneuvering indoors or within a vehicle, this shorter overall length equates to faster handling and easier management in tight spaces. 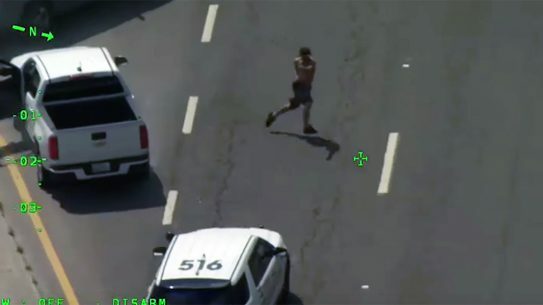 The AUG’s recoil is virtually nonexistent. My AUG sports the 1.5X optic, and I have found it to be remarkably effective for close-range engagements. 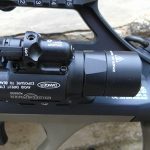 With both eyes open, the field of view remains uncluttered, and the reticle is fast and effective. As there is no imaginable circumstance in which a civilian shooter will ever need to take a defensive shot at more than 100 meters, the performance of the AUG A3 M1 is fairly optimized for defensive engagements. There are those who might say that it takes longer to reload an AUG than an AR, but I just don’t see it that way. What trivial loss you might have in speed is more than compensated for by the compact platform. 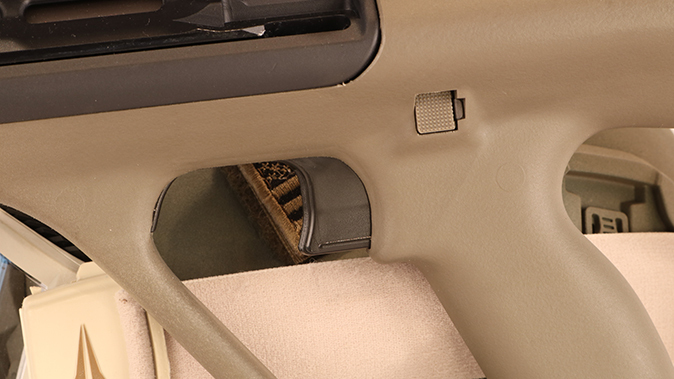 The bolt locks to the rear after the last round is fired, and the thumb of your weak hand will find the magazine release intuitively, even in a rush. I genuinely love my AUG and have never had a legitimate stoppage with the rifle. 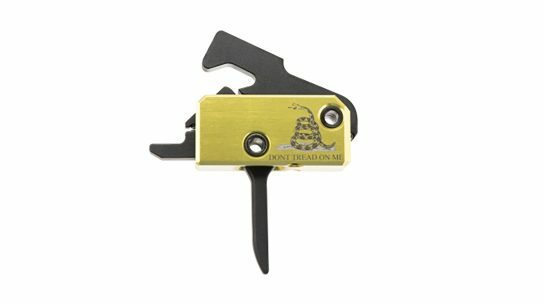 I have to bump the gas system up a notch to manage cheap steel-cased ammo, but that is why you have an adjustable gas system in the first place. If zombies ever come, I’ll reach for my AUG before anything else in my personal armory. AUG stocks are available in white, black, OD green and MUD for those who like to color-coordinate their iron, and, on a certain level, it is kind of cool to be the only guy at the range with something other than an AR. While the AUG has logged more than its share of screen time in TV and movies, its use in the first Die Hard is hands-down the most memorable. The same rakish lines and advanced ergonomics that make the AUG such a superb combat tool out here in the real world make it eye-catching on the big screen as well. The Steyr AUG, in its new A3 M1 guise, remains competitive with the most advanced combat rifle designs rolling off the lines today. 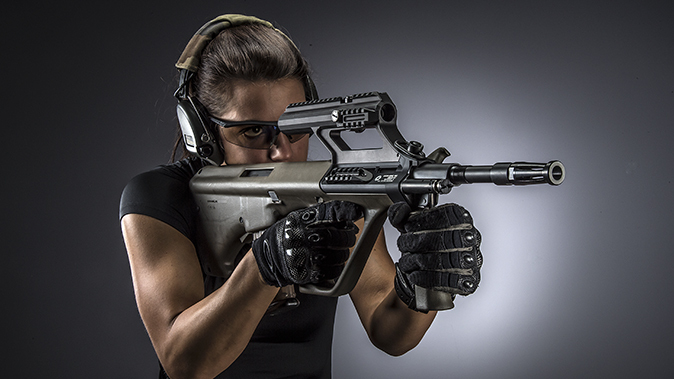 Now that aluminum receivers are commonplace and polymer furniture is passé, the Steyr AUG retains its position at the top of the food chain among modern combat rifles. 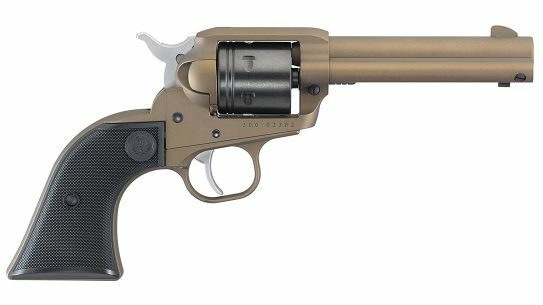 This article was originally published in the 2017 issue of “Black Guns.” To order a copy, visit outdoorgroupstore.com.